This fall, Casa 0101 Theater in Boyle Heights was transformed into Teatro Moz—an evening of live music and theater celebrating “Mozlandia.” Now, Mozlandia is not a word this reviewer made up or pulled out of the air—to make it clear for any forthcoming, well-intentioned reviewers. The term was actually coined by Dr. Melissa Hidalgo, the Chicana Ph.D. and expert consultant for Teatro Moz. “Mozlandia” refers to the unique Chicano/a Moz fan-base Morrissey has amassed in his musical career throughout the Los Angeles area and beyond. In fact, Dr. Hidalgo’s forthcoming book Mozlandia: Morrissey Fans in the Borderlands, devotes an entire chapter to the birth and development of Teatro Moz in particular. The opening act at this year's staging of the East Side staple is a cheerful musical biography tracing history leading up to the birth and rise to fame of Steven Patrick Morrissey, presented as a dual timeline alongside what was happening in Mexican American East LA simultaneously. The chronology is offered in a whirlwind of multimedia video, photographs and real time audio leading up to the period when Morrissey’s music was finally in regular rotation on the airwaves in Los Angeles by world famous alternative rock station KROQ. Through eight short ensemble productions, the audience meets a diverse cast of Morrissey fans and those they touch with their fandom. Morrissey’s music, lyrics, and presence accompany them during some of the most poignant and memorable moments of their lives: falling in love; coming to terms with the loss of a loved one; a father learning to accept and support his transgender daughter; and the sorrows and hurdles faced by a college student who contemplates dropping out because she can’t afford housing. 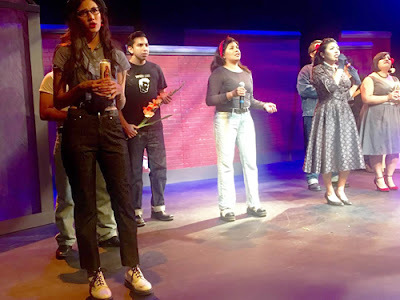 The latter, an alternately sweet and hilarious grrrl power sisterhood piece by Co-Director Elvia Susana Rubalcava, is a perfect example of the way Morrissey and his music are stitched seamlessly into both the narratives and the atmosphere of the show. In each vignette, the story line is always underscored by the Moz song that soothes both their exaltation and misery of its characters. Devan Torres is powerful as the transgender child of a middle-aged Chicano musician, played with equally riveting emotional depth by José A. García. As a father who still mourns the loss of a son, he must learn to accept his one remaining offspring, a musically gifted “boy” who identifies as Andre and no longer Andrea in a piece titled “Whittier Boulevard” by Director Michael Patrick Spillers. Newcomer Chloe Díaz is brilliant as the irresistibly ardent fan who withers in the face of an actual face-to-face with Moz. Her brother, despite his surface grousing, loves her so much that he’s willing to brave a snooty hotel on the west side where he knows he’s unwelcome, to help her meet her idol. With live Morrissey music delivered on stage by the production’s musical director Alexandro D. Hernández (of ¡Aparato!) on electric bass, Toni Santoyo on drums and Rafel Linos on guitar, Teatro Moz resounds with lyrical, musical and universally human truths. The contrast that is Morrissey’s music, which zig-zags between elation and misery, is as grey as life. Teatro Moz ensemble playwrights and the creative team of actors, musicians, playwrights, academics and Casa 0101 producers who collaborated to manifest an idea are not so much concerned with the question of why they love Morrissey as they are with shedding light on a fascinating, if little known, cultural affinity. Perhaps the question of why Chicanas/os gravitate so intensely to the crooner born in England to working-class Irish immigrants should simply be laid to rest alongside the stereotype of the passionate, but macho, Latin lover. Teatro Moz is really about how. How far and to what lengths die-hard fans are willing to go to make room for a revered musical icon in their lives. Teatro Moz is less about Morrissey and entirely about the fan experience. Perhaps this universal feeling every fan understands can make even the most cynical Morrissey contender walk away with a sense of respect for the fan experience as is the case in “Half a Person,” the piece written by Allison Lowenstein in which Ray Rios stars as a jaded Morrissey impersonator opposite a show-stopping Miriam Peniche in the role of a fan who has her entire outlook on life restored and rejuvenated during their encounter. Teatro Moz is not the first tribute to the former Smiths lead vocalist in Moz Angeles, and if locals fans are any indication, a number of Moz tributes are already the stuff of tradition in Boyle Heights. The worship and tribute to the “Pope of Mope” has been evident for some time just couple blocks west of Casa 0101 at East Side Luv, a live music venue adjacent to historic Mariachi (another distinctly Latino crooner tradition) Plaza. Regular “Morrisseyoke” (karaoke featuring Morrissey's repertoire exclusively) hosted there by Alexis de la Rocha, lead singer of electro-trio Lex has been known to fill the popular club to capacity. Moz fans rejoiced, and conversation gave way to inspiration and the writer/director Michael Patrick Spillers was enlisted as the director of the new Teatro Moz. incarnation, a follow-up to an earlier version presented as a staged reading series in 2014 at Casa 0101. The series was the result of a themed-playwriting competition which drew upwards of 30 submissions. Director Spiller and Co-producer (as well as contributing playwright) Jaime Mayorquin whittled the entries down to a group of ten best-suited for presentation on stage. According to Mayorquin, Dr. Hidalgo was then invited to help select the winning plays from among those finalists. Now streamlined and taut, Teatro Moz remains the only theater production to date on, about and for the legion of Morrissey fans in LA. And if Morrissey ever shows up for Teatro Moz, everyone, including this theatergoer, hopes he’ll appreciate the living tribute. Catch the last weekend of Teatro Moz at Casa 0101 Theater, 2102 East 1st St., Boyle Heights, Los Angeles through this Sunday October 16th, 2016. Call 323-263-7684 for reservation. Photo: Ensemble performers express a perennial East LA love for all things Morrissey.